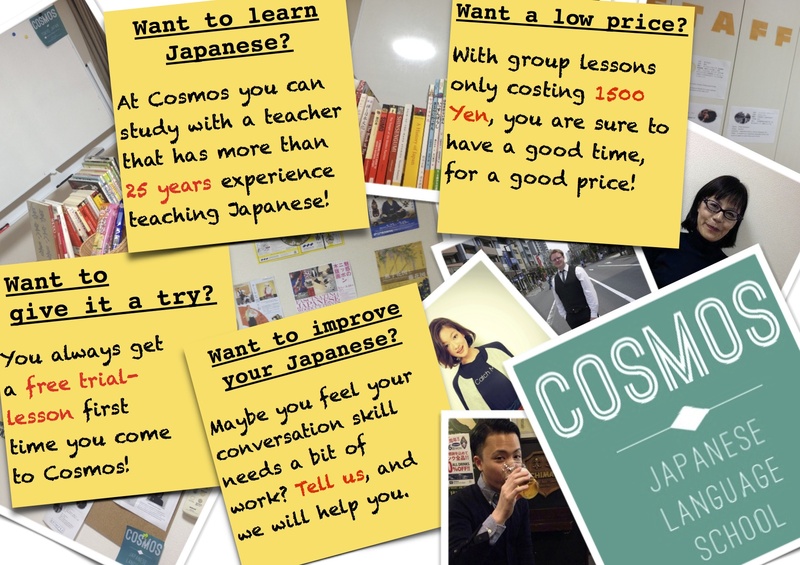 Welcome to study at Cosmos Tokyo! No matter if you are new to the Japanese language, or if you are already studying. Everyone is welcome to study with us. Perhaps you have found that you need to learn Japanese as part of your work? Or you feel that conversation is still not your strong point, despite studying every day at school? At Cosmos Tokyo, you can tell us what you want to work more on, and we will help you with that. Our teacher having more that 25 years experience af teaching Japanese, in Japan and abroad, from beginners to business level. We can also help you prepare for the Japanese Language Proficiency Test (JLPT). Your first time at Cosmos is always a free trial-lesson. After that, it is only 1500 yen/lesson for group lessons. If you bring a friend or relative, however, you get a free lesson! And you can study with you friends or your family! The school is located in Hanzomon, on the Tokyo Metro Hanzomon-line. With just a two minute walk from the station, the school is really close. Just take Exit 3A at Hanzomon, and when you get to street level, go down the street to the right of the petrol station. In the very next crossing, turn right, and you will soon see Glenpark Building on your right. You have arrived! So why not come and study with us today?! If you have any questions, or want to book a lesson, feel free to contact us at cosmos.jls@gmail.com.